I purchased this 'tool' with the intent to use it for cutting aluminum siding. I'm currently replacing windows and needed to cut the siding and enlarge the opening. I didn't get halfway through the first window before the metal cutting blade became so worn as to be worthless. Ended up using a metal cutting blade on the circular saw to finish the task. I also tried the Rotozip, with the appropriate bit, on cutting some drywall which had to be replaced. It was good for raising a lot of dust but it was quicker to use a drywall saw in the long run. What do ya' mean No ZipMate?! Bosch does make all the attachments for this series as for the last. 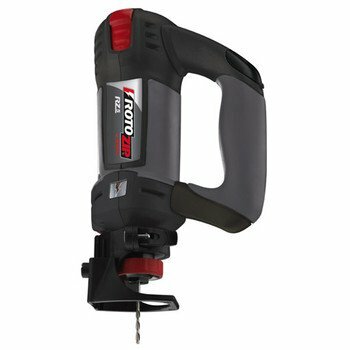 In fact the RZ20-2100 kit comes with the cutoff/grinder attachment and circle cutter. They have actually increased the number/type of bits available as well. My first job with it was cutting out a section of the back vertical part under the top storage section of my computer desk so the monitor could be pushed back another 3-4 inches. Other choices would have been the jig saw, 3" circular saw, or a hand saw. All would have been awkward without taking the top hutch off first. This cut right through the 1" thick laminated pressboard fairly easily and I didn't even need a guide to cut a darn near straight line. Its certainly not a required tool, or one of the first ones to go in a starting out tool collection, but if you have gotten to the point of buying any specialty or 'convenience' tools, then its a good choice. For $140 or so for the RZ20-2100 kit that includes the top line RZ20 unit, the cutter/grinder, circle cutter, a bit case, and a nice soft sided carrying case for it all, I think it is well worth it. 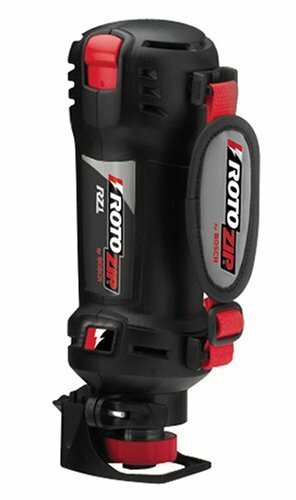 I like the newer improvements Bosch made on the Rotozip spiral saw compared with the original model. The RZ-10 model has the newer tacky feel, a bigger amp motor,an adjustable speed, chuckless, and can be easily converted back to a chuck type with the spindle & spindle nut off my original saw. (For working in tight places as needed. )The handle can easily & quickly be removed. It pays to take your time when cutting with it for the bits may break when pushed too hard. This is one tool one needs to cut in various places when the other saws will not fit or work. The switch & fan slip problems were fixed by Bosch also. In my personal opinion, this tool has a learning curve but a handy dandy tool when working on projects & in the house. I used this to replace a shower valve - cut out some tiles, some drywall, it was an absolute dream, couldn't imagine how fast it was at work I was dreading. The bits are a big problem. I have gone through 4 tile cutting bits now (at about 6 clams a pop) - about one per foot of cutting, and I am someone with a gentle touch with tools - I have never broken a jig saw blade or drill bit. I've had this tool for quite a while, and use it all the time. 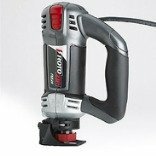 Easiest way to make clean cuts in metal, brick (with diamond cutoff blade), drywall, etc. Also, the only tool I've found for doing blind cuts into a corner, like when replacing a single hardwood floor board. I haven't had the bit-life problems another reviewer mentioned; it might be they need a carbide tip. The only significant problem I've run into is getting into tight spaces; taking the base off helps, but the body is still a little wider than I'd like. I am a home improvement junkie and enjoy doing projects around the house. The wife & I are looking to buy a new home and we decided to get the house in tip-top condition before we sell. I am in the process of installing a laminate floor that replicates the look of ceramic tiles in the foyer. I wanted the Roto Zip tool to make the cuts. The tool works great, however, the bits wear out so fast cutting through the laminate. My old sabre saw using fine tooth blades last alot longer. The new rotozip is fantastic! The 3-jaw chuck works great (works like my drill). It also comes with a wrench to manually tighten the collet if you prefer to do this. I have been cutting wall tile with the rotozip brand tile bits and they have been breaking on me, which has been frustrating. I switched to a Dremel tile bit, and I have had no problems. So, how well does that new wrenchless chuck with the red wheel work? Vizualize the bit falling out twice the first time you cut the sheetrock out of a window opening. Vizualize a tool which NEEDS a wrench, but unlike the previous models is not designed to be tightened with a wrench and provides no place to store a wrench. The wrenchless chuck gives a whole new meaning to the words "reverse engineering". I'm not sure if other people have gotten bad tools or what, because i've had great luck with my circle cutter! it flys through drywall, and i use it to cut out circles in 3/8" plywood for my daughter's room. I had no problems with it at all! I tried cutting over 20 circles in 1/4", 3/8, 1/2" plywood and in 1/2" pine stock - just won't cut a clean hole - always tends to spiral towards the end of the cut. The attachment is made plastic and is not designed to do anything near 'precision work. Maybe its OK for drywall. Go slow and keep your cost low. The trick to using these bitsand keeping them from snapping is setting the depth guide to just below the outside surface that you are cutting, but slowing down your cutting rate the futher down the bit you go. In other words, when you cut a thin material at the edge of the bit, with the guide set low, cut SLOW as the force is on the end of the bit and it can snap easy. Go slow and keep your cost low. What else are you going to buy? For general purpose cutting these are the choice. They do well in a variety of non-abrasive materials. Just don't push them hard or you will need another 5 pack right away. The bits do better if you just let the tool do the work. They are kind of hard to control if you want a nice cut. But that's the nature of spiral saws . The down cutting spiral is nice since the dust is blown away from you instead of back at your face. It's pretty simple , if you have a spiral saw , you need these bits. Great bits for a great product and a real good price. If you have a Rotozip, you need bits. I'm still learning how to use mine and I have broken a few bits. If you are like me, get a five pack, you will need them. They work real well and cut through most anything. Just take your time when you are cutting something for the first time. Let the bit do the cutting. Don't try and muscle your way through. 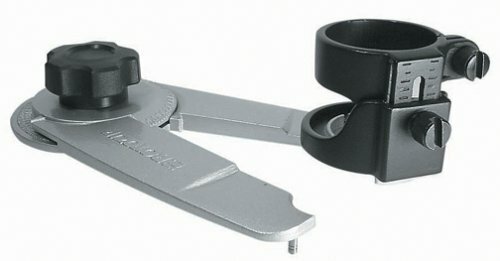 However, if you are cutting tiles or ceramic, get the ceramic tool. This bit is incredible. It has cut through everything that I have used it on and it is still as sharp as the day I got it. It really lasts a long time. Great for any person who had stuff to cut and wants a bit that will cut through many different surfaces. I am a remodeler and cutting plaster/buttonboard in older houses can be tough. I got only one hole cut for a six 6" can lights before my Greenlee hole saw was ruined. This bit in my Rotozip cut the last five and plenty of holes in the walls for outlets and for pulling wire (unlike a regular electrician I have to patch my holes so a square cut is worth it) . It did take a couple bits (you can see the "teeth" getting worn down) and near the end of a bit's life, you get more cutting by working the bit in and out. It's a dusty job and you should wear more than a cheap dust mask. I also found a full face shield worked much better than goggles. $10/bit is expensive but they get the job done. The Rotozip is great for drywall if the shaft lock don't break, however the other accessories are a big bust and this one tops the list of worthless items I have bought for the only Rotozips I will ever buy. 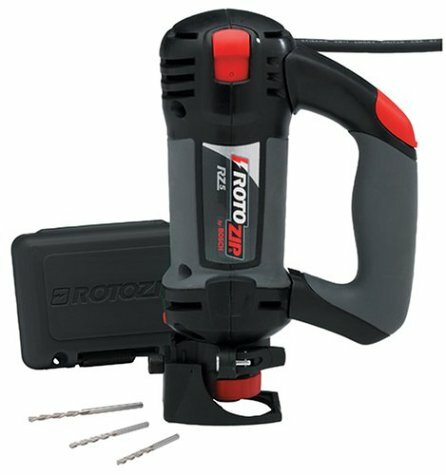 As a home builder I bought 3 Rotozip tools a year ago, never again. I am always amazed to see positive reviews for products which are total duds. This is a true puzzle, which I cannot explain. But I must rely on my own experiences when I judge a product, and by that standard, this RotoZip bit is a full-on, undiluted ... with no redeeming value whatever. Contrary to the manufacturer's claim, it will NOT cut stucco. Trust me...I'm positive. I'm installing a "through-the-wall" air conditioner, and I tried to use this bit to cut through the wall's stucco covering. Absolutely no dice. You might as well use a nail file. But I've learned that there are tools that work. If you must cut through stucco (or similarly hard materials) consider a Milwaukee Sawzall (reciprocating saw) and a Milwaukee tungsten carbide blade. Worked for me...although I used up two blades in the process. 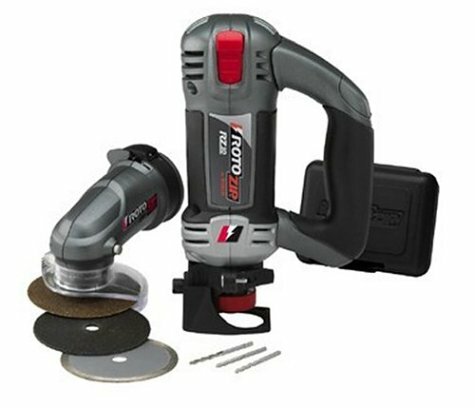 You should also have good results if you use a 4" grinder (e.g., Makita, Bosch, Milwaukee, etc) and a dry-cutting diamond blade. These tools work, and ... sells them all...but stay away from the RotoZip, unless wasting money is one of your hobbies. 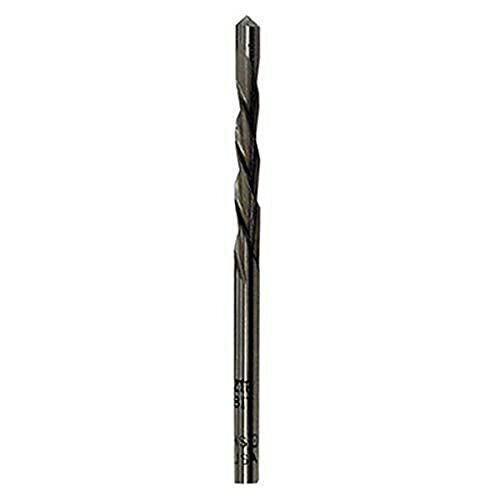 RotoZip Carbide bit RZ250 1/4 inch. Alright--imagine being in the middle of a tile project and needing to make a cut. This is your first big tiling project so you don't really have any special tools like a wet saw--and you of course hadn't had to foresight to rent one. Well this was the position I found myself in one day when I was tiling my bathroom. My solution was to order the rotozip bit and I must say I have been very pleased with it. This tile bit makes it easy to cut both straight and curved lines. This is wonderful in itself because when I finally sprung for the wet saw I found out that it couldn't even really cut curved lines. This makes this bit so incredibly worth the money it costs because it can do twice as much as an expensive wet saw--and the bit is also cheaped then renting a wet saw for a day. This bit gives a really great cut and doesn't crack or shatter the tile. Also the rotozip is so easy to use making using this bit a pure pleasure. Obviously though if you are undertaking a huges project with lots of cuts you may be better off to rent a big saw or buy your own--but this little bit is great for projects that don't require a huge amount of cutting. I have been pleased with all the rotozip attachments and this tile cutting bit is great!! Don't even think of cutting 1/2" backer board with this. I am in the process of laying about 250 sf of tile and purchased these bits to allow me to make cuts in 1/2" backerboard (cement board). After one painfiully slow cut, the bit broke. 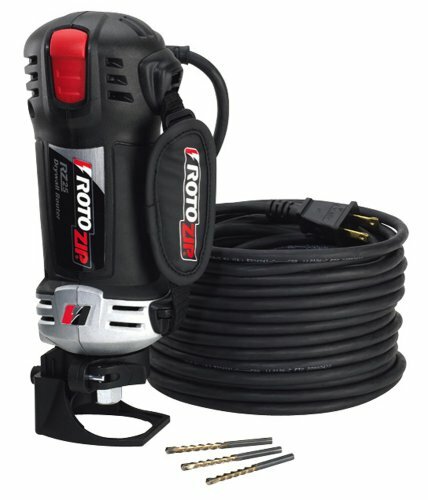 I contacted Rotozip and they recommended using the RZ250 (1/4" shank bit). It's working out very well! RotoZip says that this bit should also work, but I think not. If you are cutting thicker cement board, pay the extra [money] and get the RZ250 bit. I thought this tool was the perfect solution for my tiling project. Heed the warnings about not using it on floor tile or thick ceramic tile. I burned up a blade trying to drill through floor tile. It worked to make an irregular cut in the floor tile before it was installed but it took FOREVER. It was actually quicker for me to drive to the hardware store and have them cut the tile. It did work great on the cement backer board. I just noticed the diamond wheel for cutting tile and I am hoping that will be better. Ok. So I bought the cutting attachment for my dad for Christmas and ever since he has been practically obsessed with making bird houses and cutting holes in things. This is a really great way to make consistant and easy circles with your Rotozip. I had a chance to use the circle cutting attachment on a project and it was so nice and easy. Just imagine no more using a compass to draw out a circle and then attempting to cut it out freehand--with to rotozip circle attachment you get perfect circles every time. It is so nice and easy for people of all different levels of skill. I recommend it!! I needed to cut a 9 1/2" circle in a woodworking project I was building out of 3/4" thick red oak. I don't own a bandsaw yet, so I can't make circle cuts like Norm does on New Yankee Workshop. So I decided to buy one of these to use with my Rotozip. A lot of people are complaining that the Rotozip can't go through plywood. I don't know if that's true, but it sure did a nice job cutting though oak. It didn't leave a perfectly smooth circle, since it's hard to keep the Rotozip perfectly verticle while making the cut. But it did a better job than I could have done by drawing a circle on the lumber then making a cut with a jigsaw. I was able to easily sand smooth any irregularities. So if you have a Rotozip and you need to make **almost** perfect circles, this is a good way to go. I found that the center point drifted in these applications, and it was too hard to affix the center point to the material being cut. Like the roto-zip, it's a tool of great usefulness in specific situations. I'd never get rid of my Jig-Saw, which picks up where this tool leaves off. I bought the Circle cutting attachment for cutting circular holes in a plaster ceiling for can lights. Previously I have used an electric jigsaw for this, but the RotoZip is wonderful as long as you use a 1/8" solid carbide bit. Also be sure to drill a starting hole because of the danger of breaking the bit on the first insertion. 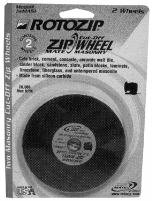 I have used this metal cutting disk with my Zipmate on the Rebel model Rotozip. I found that it's average at cutting sheet metal roofing but works wonderfully on synthetic compsites like fiberglass and vinyl. Do NOT use it on wood based composites like masonite; its burns them and destroys the wheel edge, too. The Zipmate works well on a Rebel, but takes some patience and practice to master. With the metal cutting wheel, it's like a little cutoff machine, but not for big, heavy iron pieces. It does best on smaller, thinner stock. Beware of blowing dust and cutting fumes when using the metal cutting wheel. Have plenty of ventilation in the area where it is used and wear goggles and a dust mask. Undoubtedly, This is the best device for making a fast metal cut. I used it for cutting a 1"x1" 1/16" thick iron angle and it was cutted well and fast, but the ZWMET1 disk got wasted, it reduced to 1/2 diameter, I suppose, because I did not use it in the right angle because The Zip Mate does not let You see the cutting line completely. The ZWMET1 is cheap and with practice, You'll make it work more efficiently that I did, so the first time, buy some of them !